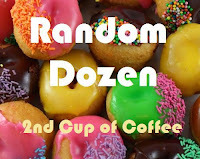 This is my first time participating in the Random Dozen meme hosted by Linda of 2nd Cup of Coffee. I noticed that some of the blogs I follow post answers to her questions. Some of them are serious but others are quite funny. I decided I needed a bit of a break today so I'm joining in. 1. If you physically lock in one age for yourself, which would you choose and why? I would probably choose the age of 46. It may sound old but I'm even older now. ;-) At that age, I think I had acquired wisdom, grown in my faith and I looked better physically, especially being skinny! That might sound vain but there were less wrinkles and it was easier to keep the weight down than it is now. 2. What is the best dish you cook or bake? I think my kids would say either cinnamon rolls, chocolate pie or chocolate cake. 3. When you feel blue, what is one strategy you use to help yourself back to normal? I try to remember to count my blessings, write in my Gratitude Journal and pray. I get outside if weather permits and remind myself that this too shall pass. 4. When was the last time you danced in public? It's been a long time, however, I LOVE to dance! 5. Do you consider yourself a realist or a dreamer? 6. As a parent, what is one thing you've done well? I've tried to offer my kids the same respect as I would anyone else....R-E-S-P-E-C-T is huge to me. They are very respectful of others, responsible and incredibly wonderful young adults! 7. What is your favorite character on the Andy Griffith show? It would have to be Barney...especially when he had his 1 bullet. 8. On a scale of 1-10, how much do you know about Dr Martin Luther King, Jr? I'd have to say about a 6. I lived during the time when he made his famous speech and his horrible assassination. I focused more on JFK. 9. What is your #1 pet driving peeve? There are so many! I guess the people that drive in the left lane, below the speed limit and are oblivious to others. Usually they're on their cell phone too and that's a double whammy! 10. What color best represents your mood today? Care to elaborate? Red. It's my favorite color and I wear it a lot. It's a gorgeous day here and I went out to lunch with a good friend ~ good times! 11. If your spouse were an animal, what would he be? 12. What activity takes up the bulk of your time on an average day? I loved getting to know a bit more about you. One thing I think I already know is that you are a very 'together' lady and this confirmed it! Great post...it is nice to read answers like this and get to know our friends better. You left a sweet comment about us loosing weight together maybe that is not a bad idea. If several of us got out here together on our blogs we could do it. I like to learn more about my blogging friends. I think I need to start a notebook or something. This was fun to read! I liked 46 too! And ditto on the computer time! Thanks for your kind, kind comments!